If you’ve been anxiously awaiting the arrival of Boone Homes’ new homes in Richmond at Ellington at Wyndham, the wait is over as the Richmond home builder has officially started pre-sales for the community. Interested buyers are encouraged to visit the sales office at nearby Westcott at Grey Oaks to learn more. Ellington will feature nine brand new ENERGY STAR floor plans designed specifically for the community and priced from $525,000. Homes will come with the option for finished third levels, basements and second floor plans with bathrooms, as well as upscale features throughout. Buyers will get their first chance to tour models of two of the home designs when the home open in the middle of October, and the first new residents will have a chance to move in once the three spec homes and first six pre-sale homes are completed beginning in late October. Construction has already been completed on the entrance sign, landscaping and utilities, and boulevard trees for the entrance will be ready by mid-September with the roads scheduled to be paved later that month. 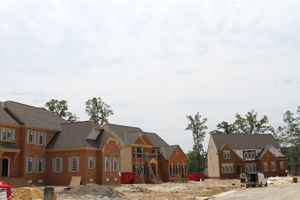 luxury Richmond homes, residents of Ellington will benefit from living in the master-planned community of Wyndham. Community amenities include tot lots, tennis courts, basketball courts, a soccer field, amphitheater, gazebo and a swimming pool. Homeowners may also join the Dominion Club, which is situated in the middle of the community, and offers a 28,000 square foot clubhouse with a restaurant, private dining rooms and meeting rooms; a fitness center; tennis center 18-hole golf course with driving range and a pool. Boone Homes website or call 804-708-5127.